View the gallery from the reception here! NASHVILLE, TN.- The stars came out Tuesday evening, to pay tribute to William Lee Golden of the Oak Ridge Boys at a special reception at the Tennessee State Museum centering around an exhibit of his paintings. American Idol winner Bo Bice, Olympic gold medalist skater Scott Hamilton, Country Music entertainers Lynn Anderson, Charley Pride, T.G. Sheppard and Jeff Cook, were among the many stars attending the reception. William Lee's fellow Oak Ridge Boys -- Joe Bonsall, Duane Allen and Richard Sterban, also attended and later joined William Lee for a short performance that included the Oaks’ big hits "American Made" and "Elvira." William Lee told the assembled crowd, “It’s a great honor to be here and . . . to be doing this during the CMA Music Festival.” He also thanked the group’s longtime manager, Jim Halsey, his publicist Pam Lewis and others. William Lee’s colorful, vividly detailed 23-piece collection were on view for the public to enjoy at Tennessee State Museum until June 13. Golden’s captivating paintings feature rich natural landscape images. The singer’s artistic expressions are drawn from his extensive world travels and deep passion for photography. Many of his pieces are created while on the road during Oak Ridge Boys concert tours. William Lee Golden uses a skillful technique that brilliantly infuses color and light. The legendary artist’s work has been exhibited in galleries, museums, and wineries across the U.S. His paintings can also be found among private collections. Golden’s unique ability to balance a dual career of performing and painting is well recognized in the world of art. “William Lee Golden uses the medium of paint on canvas while traveling as an outlet for his natural creativity. In recent years, the art of painting has become his second passion. Like acclaimed folk artist Grandma Moses, Golden has no formal artistic training and began painting later in life, which has certainly not deterred collectors interested in acquiring his work,” says Tennessee State Museum Executive Director Lois Riggins-Ezzell. Golden, the renowned Mountain Man, says being selected for the exhibit is truly humbling. “Having the opportunity to show my entire collection of paintings at the museum is the greatest honor I’ve received since becoming a painter 8 years ago. I have a great love for the state of Tennessee and its people. I’m grateful to Lois Riggins-Ezzell and her staff for selecting my artwork,” says the award-winning singer. In honor of the Tennessee State Museum exhibit, one of Golden’s most popular paintings, “Bush Garden” will be on loan from the George Bush Presidential Library & Museum where the piece was recently chosen as part of the facility’s prestigious permanent collection. The painting depicts the vivid garden at the Kennebunkport estate of former President George and First Lady Barbara Bush. ”The Presidential Library Foundation is proud to have received the generous gift by William Lee Golden of the original painting. 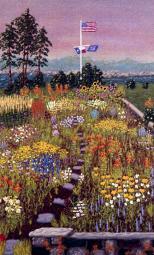 His inspiration of robust and colorful wildflowers, highlighted by the great American flag flown on Walker’s Point in Maine purveys a beautiful statement of calmness and serenity. His friendship, generosity and artistic talent are greatly appreciated and will be seen by thousands of visitors from around the world,” says Foundation official Bicker Cain.